As Thanksgiving approaches, we are reminded to count our blessings and remember all that we should be thankful for. However for the elderly population, Thanksgiving and the upcoming holiday season can be a difficult time. Many seniors may feel lonely and can be reminded of people they may have lost in the past. The lack of family get-togethers, an inability to get around, or the feeling that they cannot fully participate in holiday functions can lead to depression and isolation. Commonly known as the holiday blues, elderly depression during the holidays affects seniors around the world, and most often on holidays such as Thanksgiving and Christmas or Hanukkah. Studies have shown that feelings of loneliness come with health consequences, and interaction with others is crucial to positive emotional health in the elderly population. The sadness associated with feelings of isolation around the holiday season can become more pronounced, given that the emphasis is on celebrating with friends and families. For everyone, it’s important not to let stress ruin the holidays for you or your loved one, and equally important to raise awareness about loneliness among the elderly during this time of year. Luckily, there are ways you can make Thanksgiving a happy holiday for everyone, including the elderly members of your family. Discover ways to include older relatives in festivities, by modifying the celebration! For example; for those who have more difficulty getting around, consider hiring a home health aide to transport and assist your loved one to a family event. Talk about memories with your loved ones. Something as simple as going through and organizing old photos can be helpful and reassuring to the elderly. Simplify routines and modify traditions to reduce stress and accommodate those relatives with special physical needs. Be conscious of potential difficulties with a holiday if your loved one has any physical or mental limitations. Would your loved one living with dementia be overwhelmed and anxious at the large gathering? If so, plan accordingly. Determine what traditions may be most important to loved ones, and then figure out how to either continue those traditions or modify them into new ways. 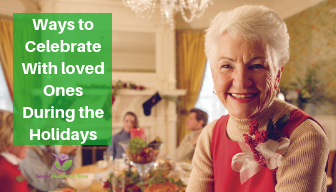 Feeling a part of the holiday season is important to your elderly loved ones. Offer to help by shopping, running errands, picking up gifts and mailing packages or cards. Assist with gift wrapping, preparing packages and making them feel included in the usual holiday festivities. How ever you are able to celebrate Thanksgiving with your elderly loved ones, remember to be thankful and enjoy this special time together. Thanksgiving is a very special holiday, and there is no need it should bring any unnecessary stress on either the family caregiver or your elderly loved one. The perfectly set table, and the huge meal, really is secondary: The most important thing you can do with a senior to make them feel loved and included this season by spending time with them. Look at family photos; visit with special gifts from the younger relatives or grandkids. Watch home videos or movies, listen to seasonal music, and play games together. Regardless of what you decide to do together, any time you share is a precious gift.